Are you going on a diet, or maybe you’re just looking for the perfect low calorie snack to satisfy a craving? Mochi ice cream is the perfect low calorie snack to satisfy any sweet tooth. When you’re on a diet, you shouldn’t feel deprived. If you’re decreasing calories each day and working hard to exercise, then small rewards can also be incorporated into your diet. At Mochi, we know that it’s really all about moderation. A bite sized serving is all you’ll need for those sweet cravings to be fulfilled. If you’ve got a sweet tooth that won’t fall out, mochi ice cream is perfect for you. Dessert is one of the most common things that people miss when going on a diet. Lucky, with small portions of mochi ice cream, you won’t have to forgo dessert entirely. 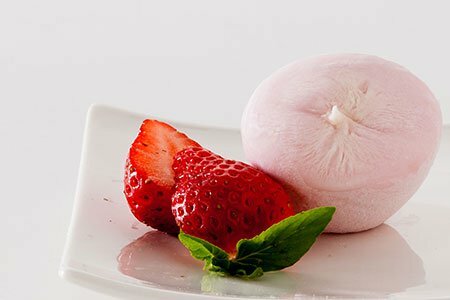 Fruity flavors of mochi ice cream like strawberry and mango will quell those insatiable sugary desires that often arise after going on a diet. Allowing yourself to have a small treat in moderation will give you the little pick me up that you need, without ruining all the hard work and effort you have put into your diet. Don’t deprive yourself; grab a mochi! The experts say don’t skip breakfast while on a diet, but we also say don’t skip dessert! We understand that making healthy choices while trying to lose weight can be difficult. But what if we told you that you could still enjoy a tasty treat, without the guilt and consequences? Just because you’re on a diet doesn’t mean that you can’t have a small portion of ice cream. The average mochi ball is about 100 calories. Whereas filling up a bowl of ice cream might equate to over 350 calories, a small 100 calorie snack won’t throw of your weight loss goals. A small taste of indulgence will keep you motivated and happy throughout the day. Most people think that a weight loss diet means eliminating all fattening foods that you love, but this doesn’t have to be the case. You can have your mochi and eat it too! Experts say that those who turn to restrictive diets are more likely to splurge and have “cheat days” that cause them to regress on their progress. Instead of cutting out all your favorite foods and creating a rigid routine, allow yourself to have small, low calorie treats like the occasional mochi. This will keep you satisfied, and therefore less likely to binge on unhealthy foods in the long run. The Mochi philosophy is to promote positivity and optimism. Mochi believes in the small joys of life, and ice cream is one of those little wonders. Promoting a happy and healthy attitude will ensure your lifelong path to a more positive outlook on life. If your tummy and tastebuds are happy, you will be too! Sharing mochi with friends and family will be a celebratory moment after a long day, and the reward you deserve after sticking to your diet all day.